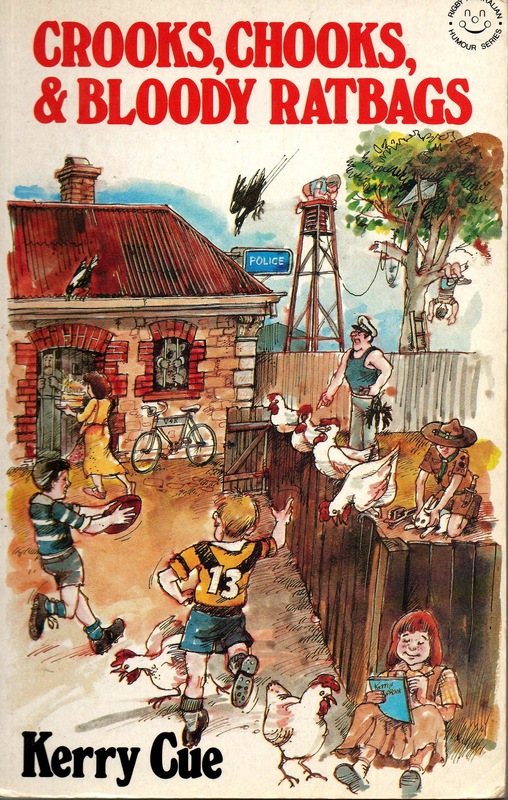 Mathspig grew up on a police station in the small Australian country town of Kyneton, Victoria in the 1960s. Mum fed the prisoners. Dad’s car an old FC Holden, maroon and white with a pink door, was the police car. And the police phone sat in the kitchen. Australia has a very strict gun laws today. Thank goodness. But such laws didn’t exist in the sixties. 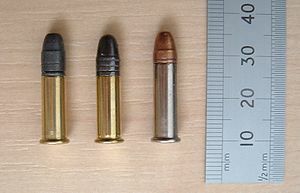 My Dad’s .22 rifle rested against the fridge in the kitchen – without it’s 6-bullet magazine – in case my dad was called out to some police emergency. There were a number of gun incidents in my childhood. One time my mum was cleaning the house. She usually put paper rubbish in her apron pocket and threw it at the end of the day into our combustion (wood-fired) stove. She forgot she had three .22 bullets in her pocket. It took some time for the bulletsto heat up. My parents were in bed when bullets started exploding in the kitchen. The explosion blew off the hot plate and blew the ash door open covering our kitchen in grey ash. And it nearly gave my dad a heart attack. 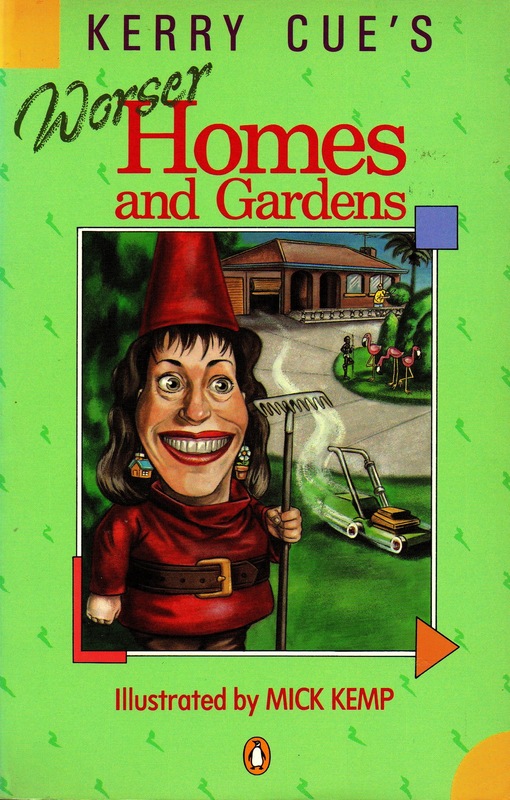 This was a typical story of my childhood and why I became a humour writer. My Dad the Sharp Shooter My dad stopped a stolen car with one bullet. This was considered legendary by his fellow cops. He didn’t shoot the tyres. He managed, by accident and possibly even though he was aiming at the tyres, to hit the electrical lead into the car’s distributor cap. Phht! Car go no more. 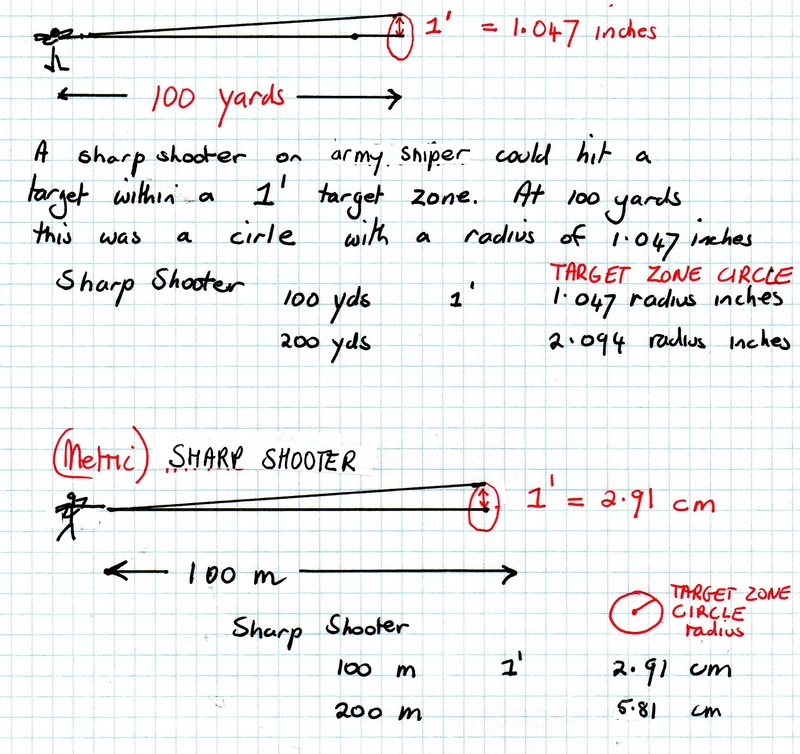 One measure of the accuracy of rifles, riflescopes but also the sharpshooter is the MOA or Minute of Angle. The MOA can also be used to define the target zone (circle). I cannot show you a triangle with an angle of 1′ because it would have to be 100m long on one side and only 3cm tall or 100 yds long and approx 1 inch tall. Needless to say, drawings are NOT to scale. A sharpshooter can put 5 out of 6 bullets in a target zone drawn at 1′ angle around centre of target at any distance. As the distance away from the target increases the target zone circle area increases. 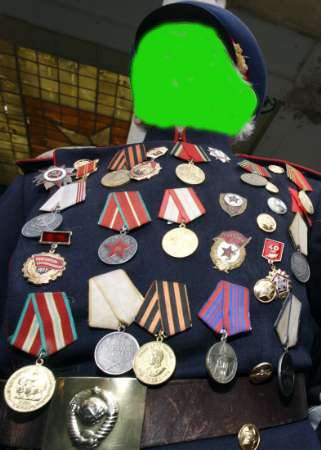 When Mathspig recently saw images of some Russian soldiers covered in medals it prompted the question ‘Would medals protect the wearer from a sharpshooter?’ Note: Mathspig has obscured the identities. This is a theoretical maths question. 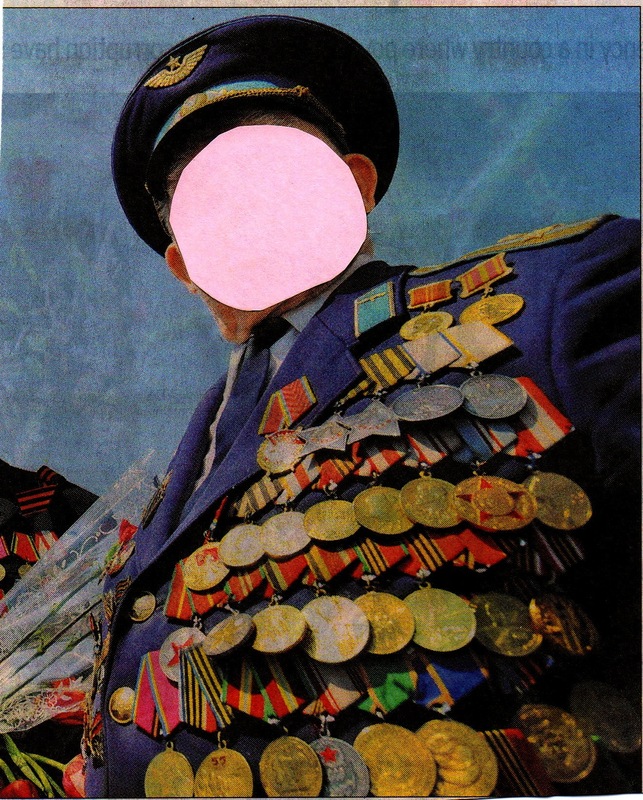 Mathspig was interested in this question because megalomaniac military dictators who take over countries by force tend to award themselves lots of medals. But they are also likely to be the target of sharpshooters from a liberation movement. The diameter of a standard military medal is 3.5 cm. 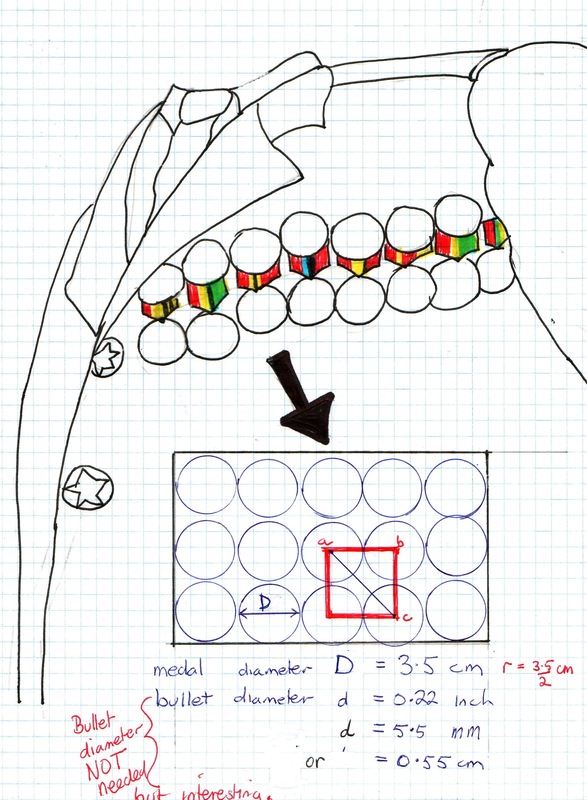 Mathspig has drawn up a diagram with loosely packed medals. 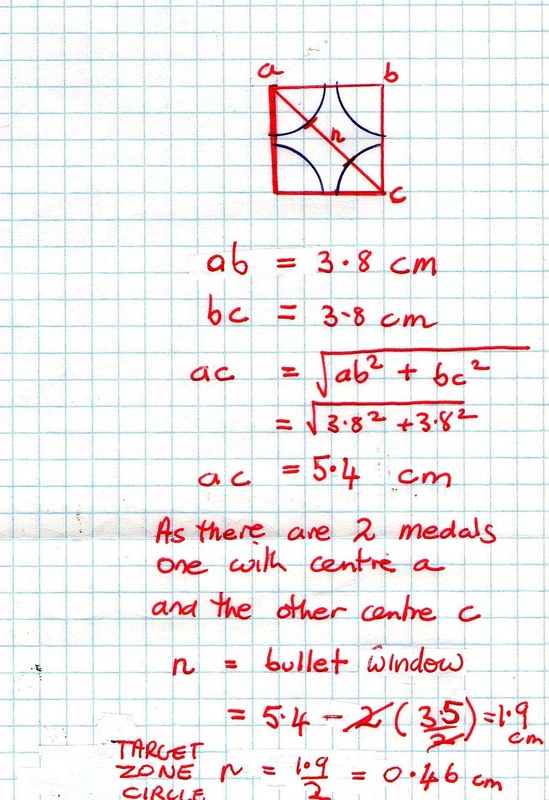 Using Pythagorus Theorem we can calculate the distance ac and then by subtracting 2r (2 x radius of the medals) we end up with the diameter n of the target zone circle. Even at 100m the sharpshooter is looking at a target zone circle with a radius of 0.46cm. That is less half cm!!!!!!! The target zone is less than the size of an American Quarter and about the size of an Australian 10 cent coin or a British Pound. This is very difficult. At 100m the sharpshooter is doing well to hit target in a target zone circle of 2.91 cm. 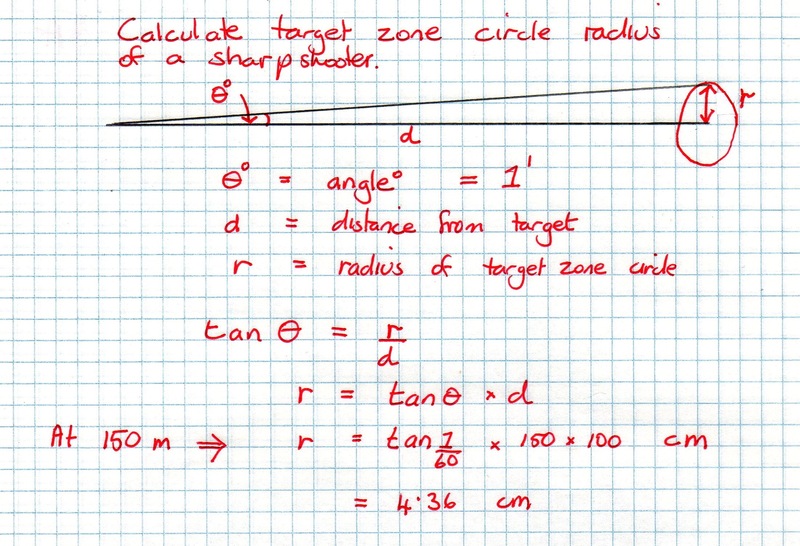 At 200m the target zone circle radius is 5.81 cm. So the megolmaniac military dictator wins!!! 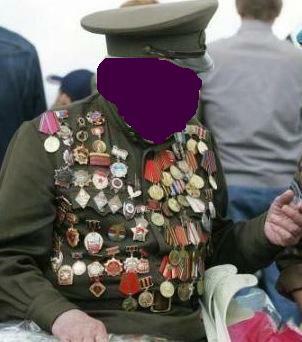 He IS protected – on his chest – by his medals!!!!!! Unless the sharpshooter manages a ‘lucky’ shot. Another way to look at the sharpshooter problem would be to calculate the MOA – or minute of angle- to get inside the target zone. Here are the calcs for 200m. Find WEB 2.0 Scientific Calculator handy here. When creeping around looking for a baddie in a house/apartment/disused factory our hero can duck a bullet. Especially good at ducking bullets are spy heroes James Bond and Jason Bourne. NEXT CLICHE: 2 You Can Out Run A Fireball! Follow the link to the remaining cliches. On 23rd July 1983 Air Canada Flight 143, a Boeing 767 ran out of fuel at 41,000 feet (12,000m) altitude, about halfway through its flight from Montreal to Edmonton. The crew managed to glide the aircraft safely to an emergency landing at Gimli Industrial Park Airport, a former airbase at Manitoba. This was some challenge. No fuel means no engines. No engines means no electronics, no steerage, no navigation. An emergency propellor driven dynamo ( similar to that used to produce light on bikes) dropped down on an arm under the plane to produce basic power for steerage. Navigation had to be by sight or calculation of speed etc. That involved some maths, mathspigs. There were no fatalities. The Maths Error: Oops again! Muddling units of volume! Here it is the metric Vs Imperial problem again. This incident was shown on Air Crash Investigation (or Mayday) Season 5, Episode 6. How Maths Solved a Real Murder! 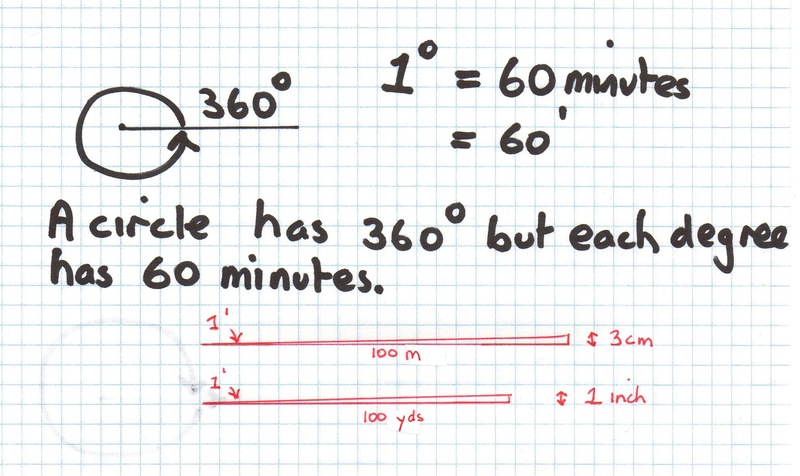 It is the aim of Mathspig to show you maths as it is used in the real world. As this is a REAL murder conviction we will be very serious in our comments. A woman was found dead at the bottom of The Gap at Sydney’s Watson Bay in 1995. It wasn’t until 1997 that University of Sydney physicist, Rod Cross, was asked if the victim could have jumped off the cliff. In 1998, the coroner declared an open finding in the death of Byrne. It wasn’t until 2003, however, that the police contacted Ross to check the maths. He said that Caroline Byrne couldn’t have slipped or jumped. The case was reopened and in 2006 Byrne’s ex-boyfriend Gordon Wood was arrested in London and eventually found guilty of her murder. Wood was sentenced last year to 17 years in jail with a non-parole period of 13 years. 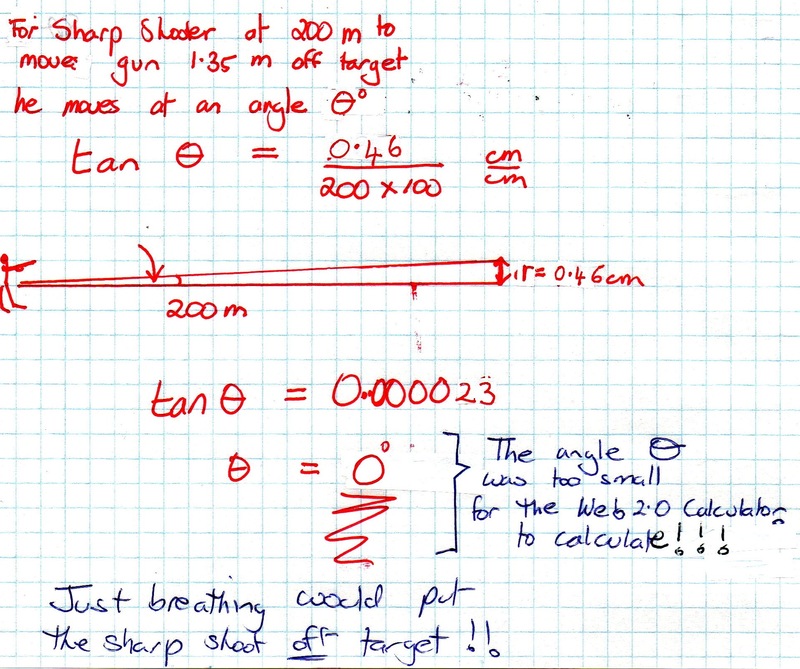 Why we are interested in this case, mathspigs, is because Cross, The Physicist, made the comment when asked during the trial (See The Australian Wednes 30th Sept 2009 ) that the maths involved was not rocket science but maths high school students would be able to master. Can we? We will assume influences of weather or air resistance are not significant. We will not include the sloping rock surface at the bottom of the cliff in the calculations. So mathspigs, you can do it? And keep in mind this is a real case. It’s not Numb3rs or NCIS. These calculations alone did not bring about the conviction. The prosecution then had to prove that a person could be thrown at sufficient speed to land 11.8m from the cliff base. To do this Cross re-enacted the experiment with two policemen and a policewoman of similar size to the victim. The policewoman was thrown into an Olympic Pool. The policemen could achieve an exit velocity of the policewoman of 4.15 m/sec, 4.37 m/sec and eventually using the strongest thrower 4.85 m/sec. Could your maths put a murderer behind bars, mathspigs? On the 3rd DEC 2008 Gordon Wood was sentenced to 13 years jail for the 1995 cliff top murder of Caroline Byrne. On 24th FEB 2012 Wood was acquitted on the murder charge in an unanimous decision by three Appeal Court judges. Justice McClellan said Wood’s behaviour around the time of the death had “raised suspicions”. The prosecution case was based on evidence given by Associate Professor Cross, but the Court of Appeal labelled his evidence biased as he had later written a book titled Evidence for Murder: How Physics Convicted a Killer. Justice McClellan noted in his judgement that “suicide could not be ruled out” and that “suspicion, even a high level of suspicion, was not enough” to convict someone of murder. You are currently browsing the archives for the Forensic Maths category.